As contrary as it sounds, "planning" -- as we traditionally understand the term--can be the worst thing a company can do. Consider that volatile weather events disrupt trusted supply chains, markets, and promised delivery schedules. Ever-shifting geo-political tensions, as well as internal political upheaval within U.S. and global governments, derail long-planned new ventures. Technology failures block opportunities. Competitors suddenly change their product or release date; your team cannot meet the pace of innovations in your market niche, leaving you sidelined. There are myriad ways in the current business environment for a company's well-considered business plans to go awry. Most business schools continue to prepare managers to be effective in stable and predictable environments, conditions that, if they ever existed at all, are long gone. The Agility Shift shows business leaders exactly how to make the radical mindset and strategy shift necessary to create an agile, entrepreneurial organization that can innovate and thrive in complex, ever-changing contexts. As author Pamela Meyer explains, there is much more involved than a reconfiguration of the org chart and job descriptions. It requires relinquishing the illusion of control at the very foundation of most management training and business practice. 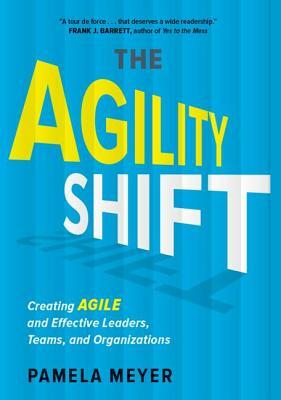 Despite most leaders' approaches, "Agility is not simply accelerated planning." Unlike many agility books on the market, The Agility Shift provides specific, actionable strategies and tactics for leaders at all levels of the organization to put into practice immediately to improve agility and achieve results. Pamela Meyer, Ph.D. is the President of Meyer Creativity Associates where she works with organizations internationally who want to be more innovative and agile. Meyer is the author of three books on innovation, learning and change, including "From Workspace to Playspace: Innovating, Learning and Changing Through Dynamic Engagement" (Jossey-Bass, 2010). In addition to her speaking and consulting practice, Pamela teaches courses in business creativity, organizational change, and adult learning at DePaul University, School for New Learning in Chicago, where she is also the Director of the Center to Advance Education for Adults.